What I Love: Cookies & Cream Popcorn! 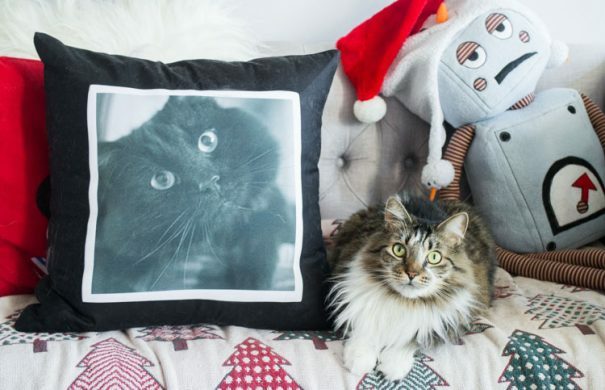 How to Make Customize Gifts for Cat Lovers! 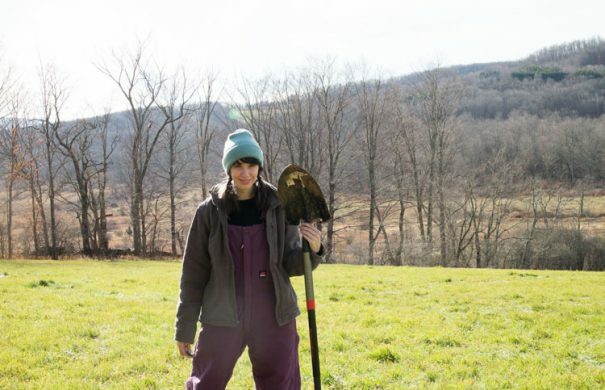 What I LOVE: My Carhartt Full Swing , A Work Jacket Actually Made For Women! Time To Decorate For The Holidays… And Dance! 12 Festive Family Beverages - Yummy Non-Alcoholic Drinks for Christmas! DOUBLE CHOCOLATE Sea Salt Hot Cocoa! 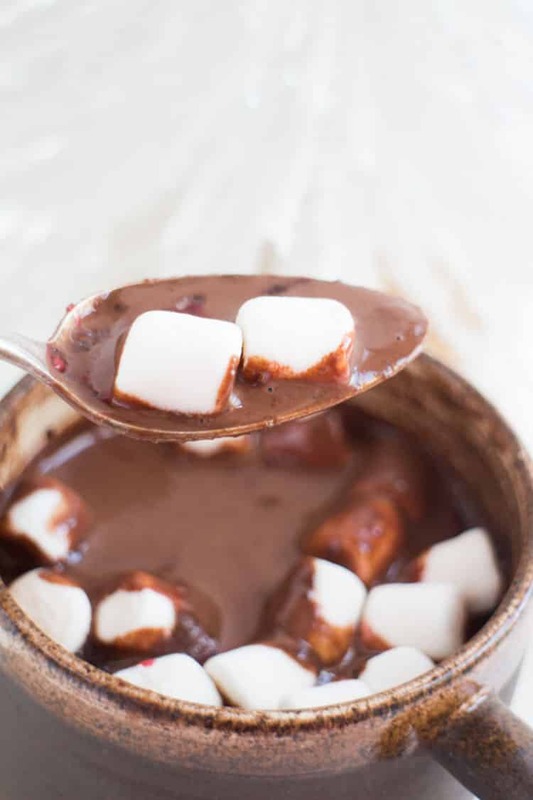 This is our favorite homemade hot chocolate recipe, it’s so rich and creamy! It’s easy and quick to make! I love adding a sprinkle of sea salt on top to help balance out the double chocolate! This drink is for chocolate lovers! That’s probably going to be your reaction when you take a sip of this Double Chocolate Sea Salt Hot Cocoa. With the holidays right around the corner (exciting!) the weather is changing here. I grew up in Pennsylvania where Christmas was usually blistery and covered in snow. In NYC, I can’t recall many white Christmas days in the last 10 years, but I can feel the weather changing. This week I’m already whipping my gloves out of my bag 2 minutes into my walk to work. By the time I make my way home later in the day there’s one thing I want when I walk in the door. Ok, 2 things, because first I want cat hugs. That’s hot chocolate. I want one nice mug of hot chocolate that will warm my hands and belly up. 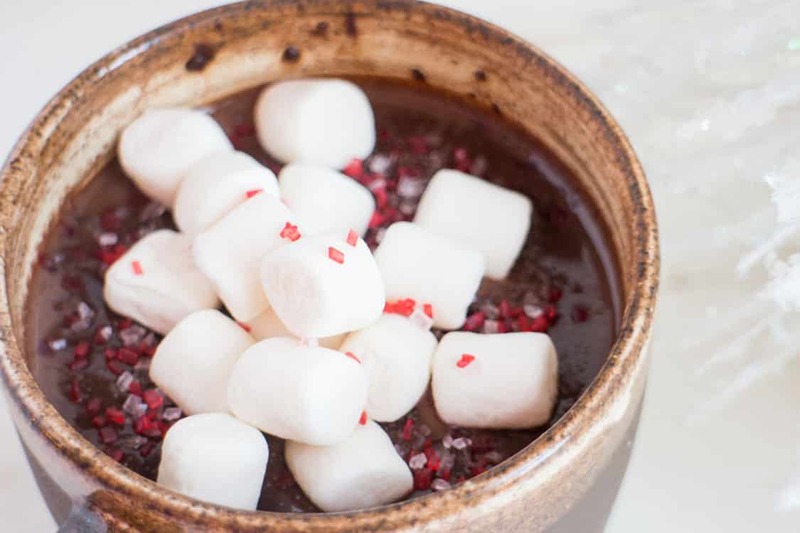 I love the combo of chocolate + sea salt, so this recipe is giving you that sweet and salty taste. Just a sprinkle of sea salt on top helps balance out the double chocolate. 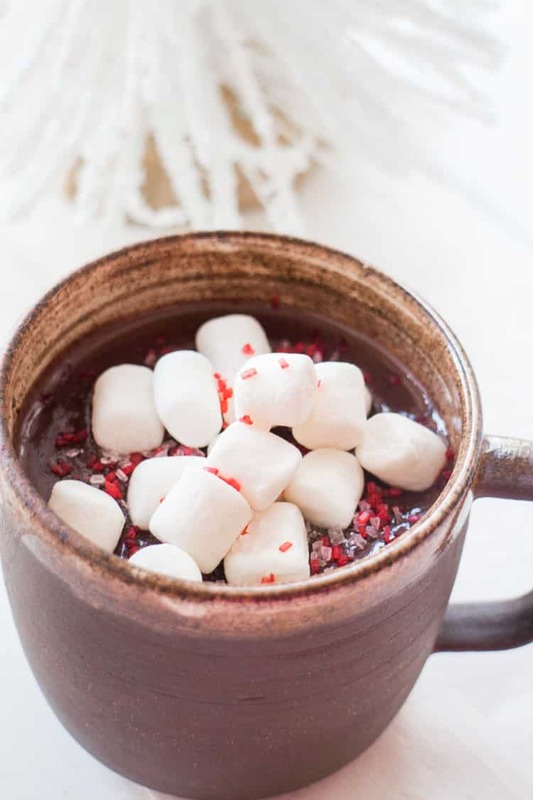 Throw some marshmallows and holiday sprinkles on top and you’ll have your new favorite Winter drink. 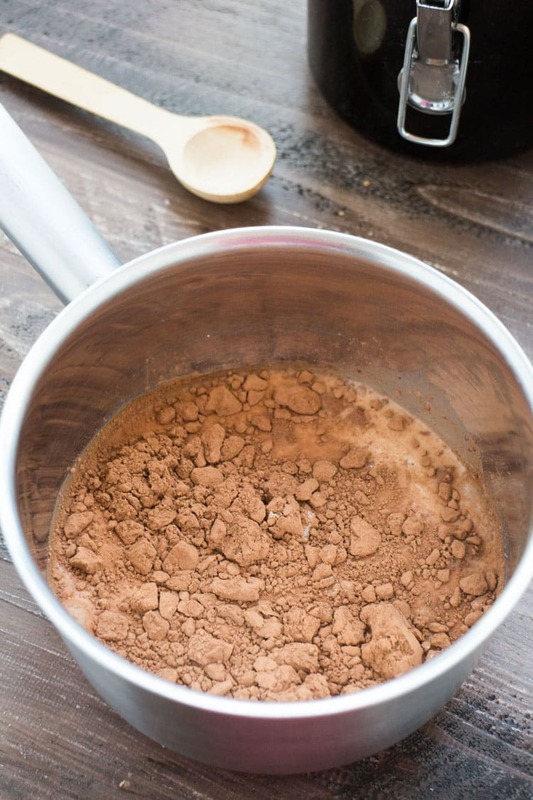 Add your milk, cocoa powder and sugars into a saucepan. 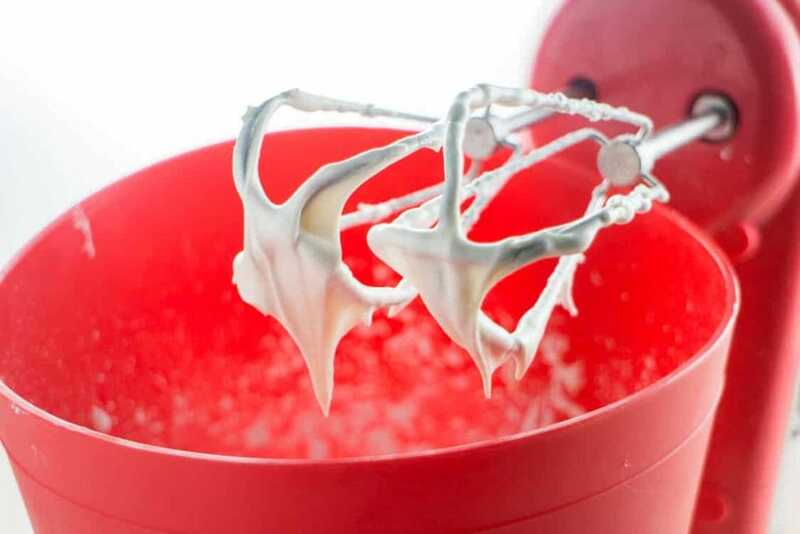 Whisk it over medium high heat until the sugars are dissolved. Add your milk and yummy chocolate chips. Once the chocolate is completely melted then pour into 2 mugs. Sprinkle a little pinch of sea salt on top of each. 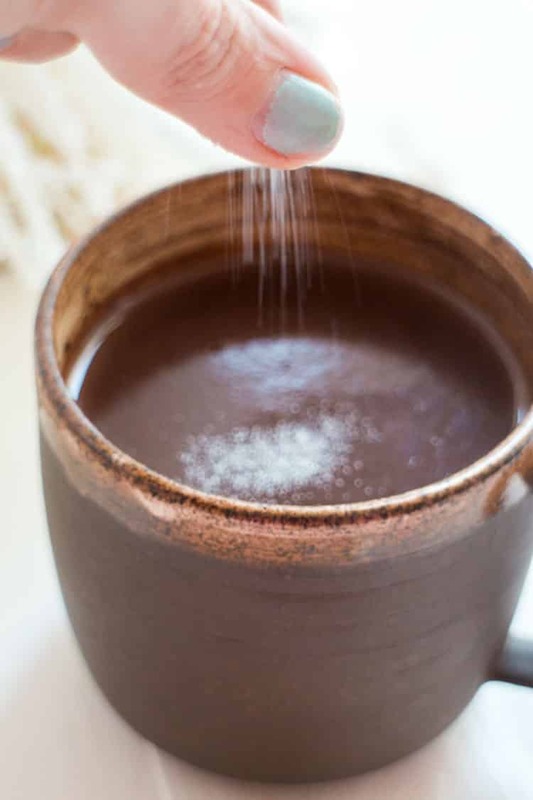 Enjoy this Double Chocolate Sea Salt Hot Cocoa and stay warm! 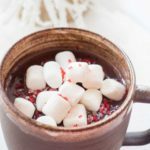 DOUBLE CHOCOLATE Sea Salt Hot Cocoa! 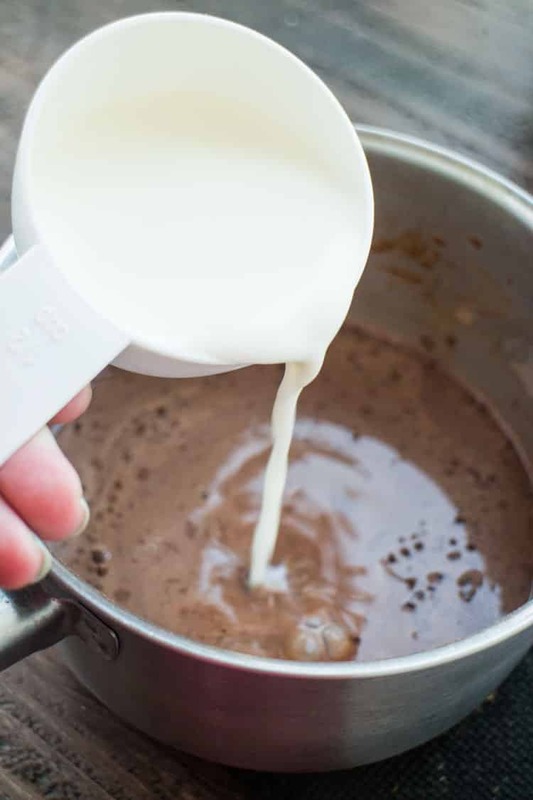 This is our favorite homemade hot chocolate recipe, it's so rich and creamy! It's easy and quick to make! I love adding a sprinkle of sea salt on top to help balance out the double chocolate! This drink is for chocolate lovers! 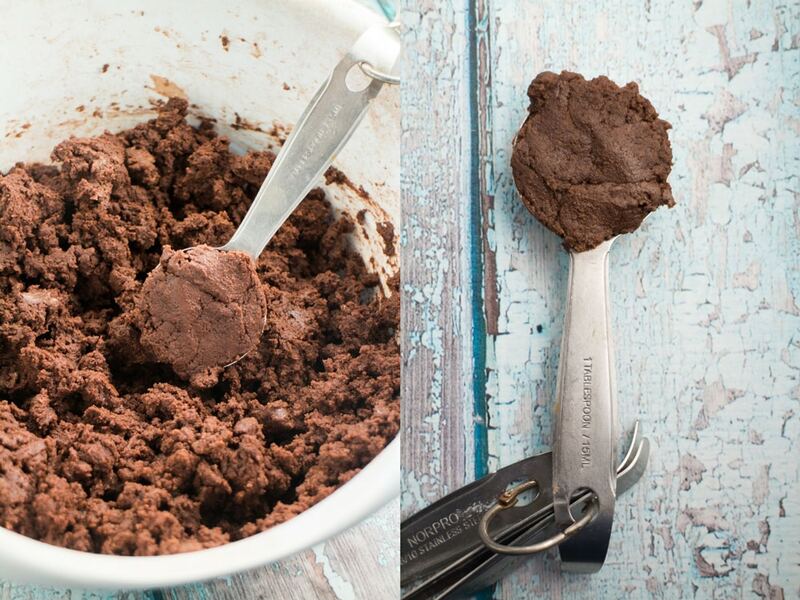 In small saucepan whisk together 1 cup milk, cocoa powder and sugars until they are dissolved over medium high heat. Add the remaining 1 cup milk and chocolate chips. 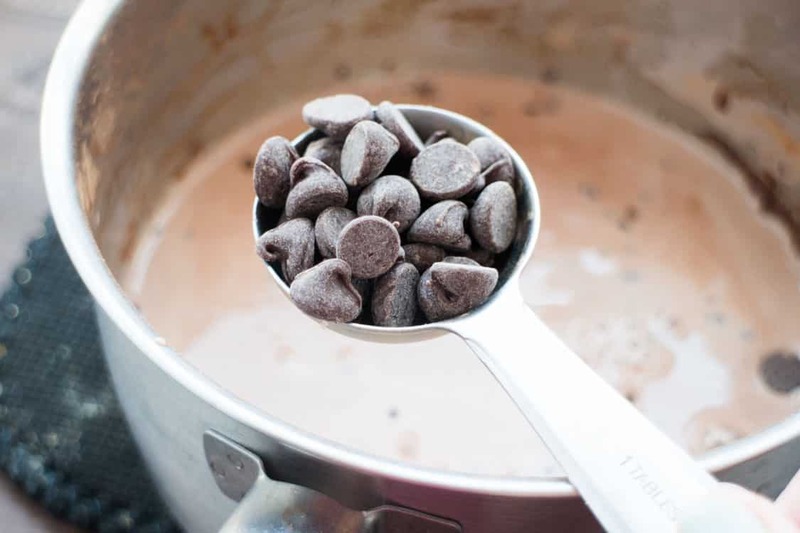 Keep stirring until the chocolate chips are melted. Run a spoon on the bottom of the saucepan and see if any chocolate comes up. If it does, keep stirring until melted. Pour into 2 cups and sprinkle a nice sized pinch of sea salt on top of each one. 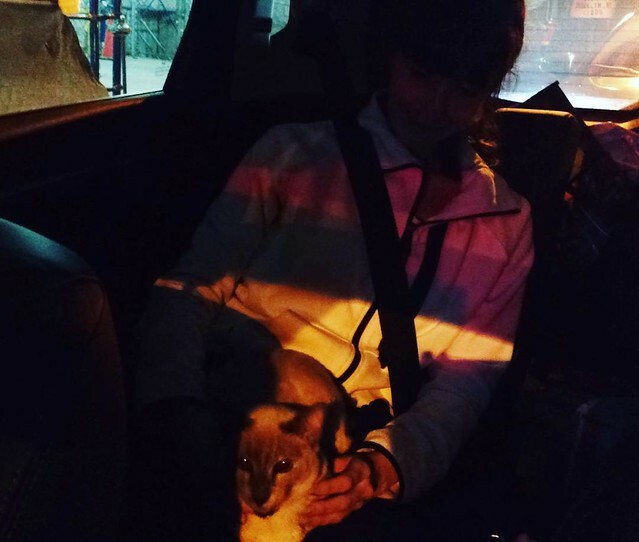 Tips and suggestions on How to Travel In a Car With a Cat! Last, last weekend we went back to Pennsylvania we went back to visit my family. This is my annual pilgrimage to Pennsylvania where Dad feeds us calories to last us a month, while I poke around in picture books and share memories of where I grew up with Matthew. Since my Dad hasn’t been up to NYC in a while that means he hasn’t seen his favorite Meowza girl, Xanadu. My dad has a sweet relationship with Xanadu and Xanadu loves being spoiled by him. Since he was missing her, we decided to take Xanadu back to Pennsylvania with us. She’s done this road trip before so we figured she’d be fine again. We also took Toes because my Dad hasn’t met her yet and she’s a awesome girl. Not to tell you the outcome of the story this quick but Xanadu didn’t like her road trip. Actually she really hated it. She didn’t like any part of it, except when we left my Dad’s a day early to come back to NYC because of how sad Xanadu was. Something upset her during this road trip and she didn’t take well to the car ride there, or his house. 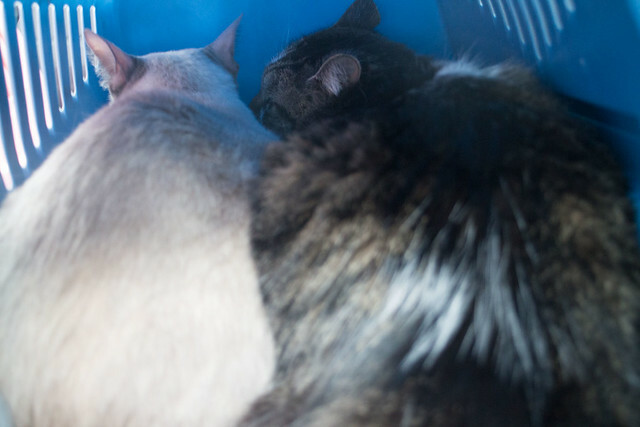 During the car ride, Toes crawled out of her carrier and into Xanadu’s to comfort her. It was a tight fit, but this did stop Xanadu from meowing. This was also another example of how sweet Toes is. Once we got back to my dad’s house it got worse. The meows stopped, but instead of being excited to see her Grandpa and his new house she was scared to go anywhere. The only place she wanted to go was in my room and under the bed. Here she is, begging to go into my bedroom. 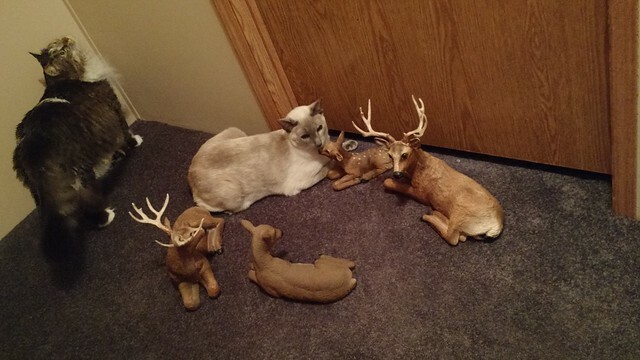 Ignore the deer, I was trying to play with her. If she in the bedroom with just me, she was calm. At night she slept with me under the blankets, just like at home. But once the door got opened she freaked out. If anyone came into the bedroom she ran under the bed until they left and then I had to sweet talk her out. By the first night I was already feeling like a horrible Cat Mom because Xanadu obviously wasn’t enjoying her time and that was the most important thing. So Matthew and I decided it was time to go home early. As much as it broke my heart to say bye to my Dad a day early (and how I could tell he was equally sad) we loaded the car, said our goodbyes and drove back to NYC. Once in the car, it’s almost like Xanadu knew she was going home. She was purring, she slept on my lap being rubbed, and once we got back to our apartment she didn’t hide or act scared. Instead she walked out of the carrier, jumped onto the couch and got comfortable. Oh and if you’re curious… Toes loved Pennsylvania! 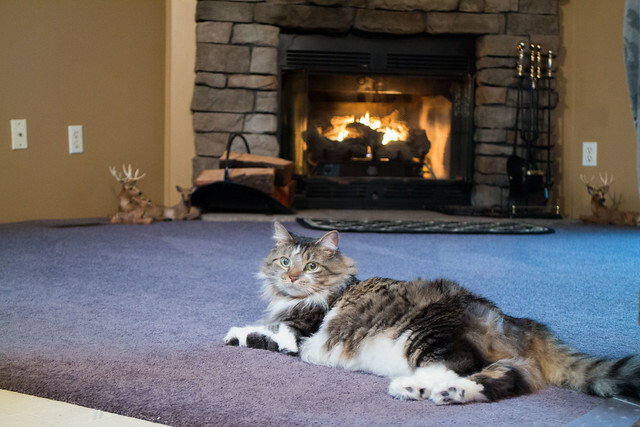 With a fire place to get warm near and endless amounts of gourmet food that their Grandpa got them, she was being spoiled. 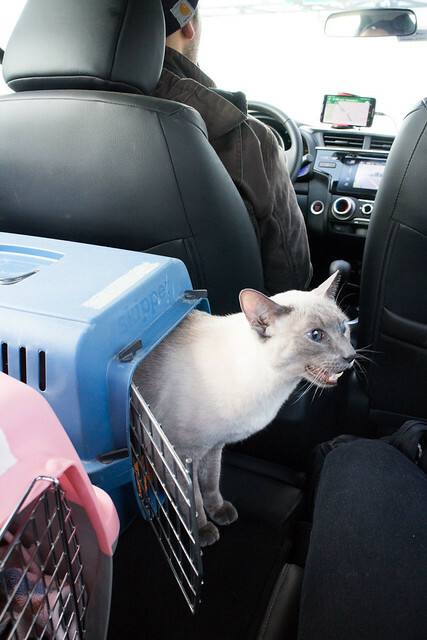 Next time we’ll travel we’ll be bringing along all the Feliway products we can fit into a car. Do you guys know about Feliway? 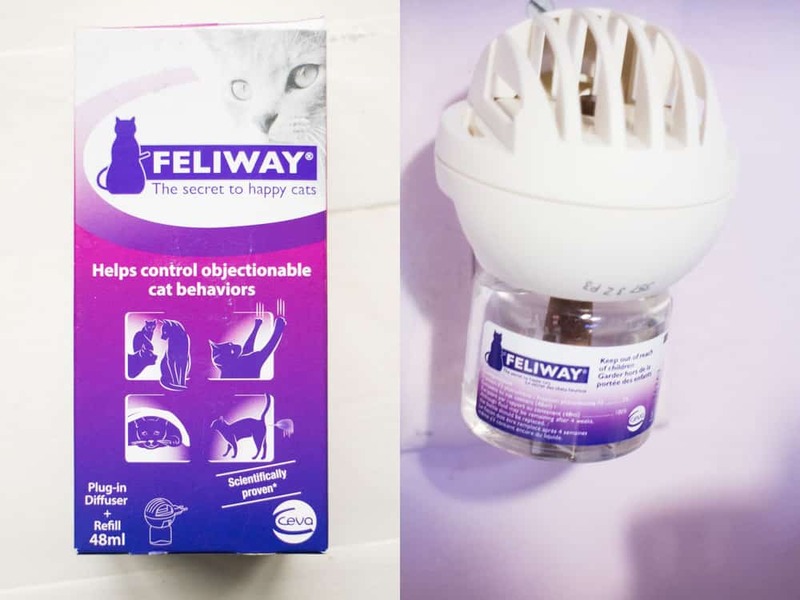 We’ve used their diffuser a few times in the house, more specifically with Essy when she was older and with FiFi Bofinkles because she tends to get stressed and territorial (that leads to bathroom accidents). 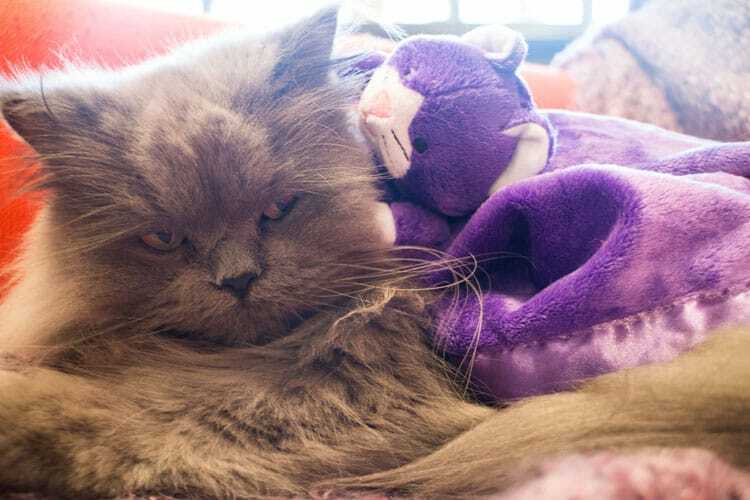 With the diffuser, you plug it into the wall and it releases a “Feline Facial Pheromone,” which is naturally produced when cats are happy and feeling comfortable in their environment. 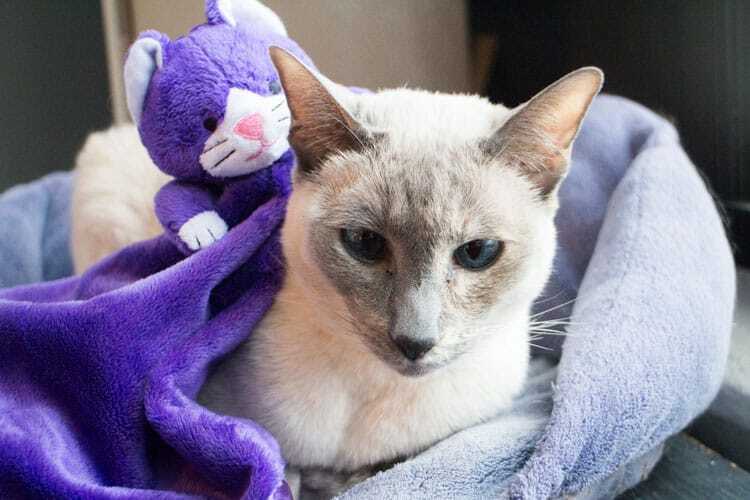 By releasing this the cats will feel comforted while reassuring them they are safe if they are coping with a difficult situation (traveling, new house, territorial cat, friends over during the holidays, etc). 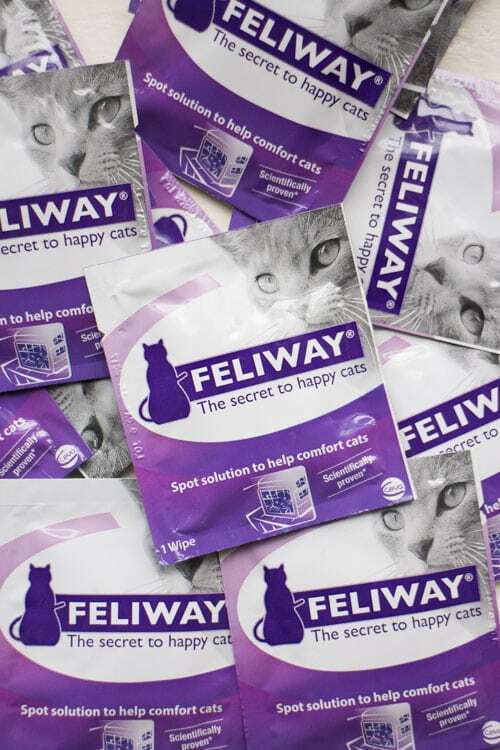 If you’ve visited your animal clinic you might have noticed they often have Feliway products in their exam rooms. Their products not only come in the diffuser but now they offer spray and wipes which are PURRFECT for traveling. 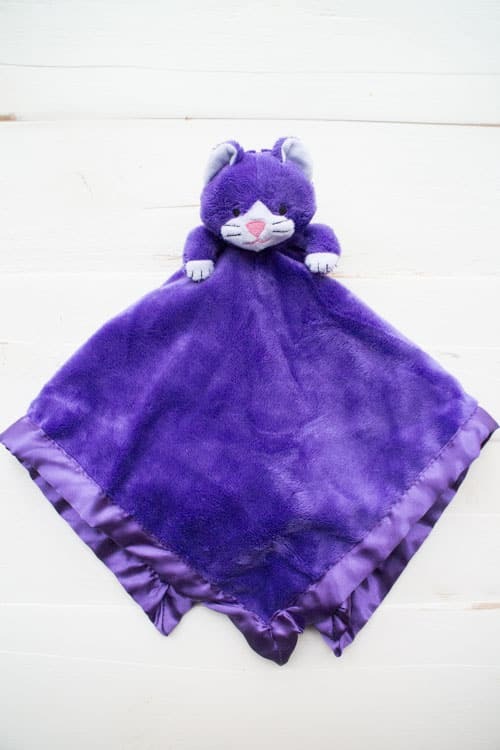 With their purple cat blanket, all I have to do is spray a little on it or use a wipe, then the cat feels much safer and comforting. You can use the spray directly in their carrier before a vet visit too. I do this when I have to take the cats in taxi cabs to calm them down. See, Xanadu… all safe now! woah cookies and cream popcorn sounds absolutely delicious! Happy New Year Pamela! In the What I LOVE series, I’m sharing current things that I love. Maybe it’s a new restaurant, maybe it’s a new cookie, maybe it’s a new cat toy, maybe it’s… anything! Yeah, well that’s how I feel about all the popcorn from Pop Works & Company right now, especially the Cookies & Cream. It’s really good and I mean reaaaaaaaaaaaalllly good. It’s so good we’re basically tackling each other to get the few pieces left in the bag. There’s side eyes being shot at one another when someone says they finished the bag without you knowing it. This popcorn is popped just right and seasoned with all the sweetness you need. i can almost taste your virtual hot chocolate! :) this is the most decadent veggie soup i've ever seen--YUM. Extra cheesy vegetable soup made with Velveeta cheese! 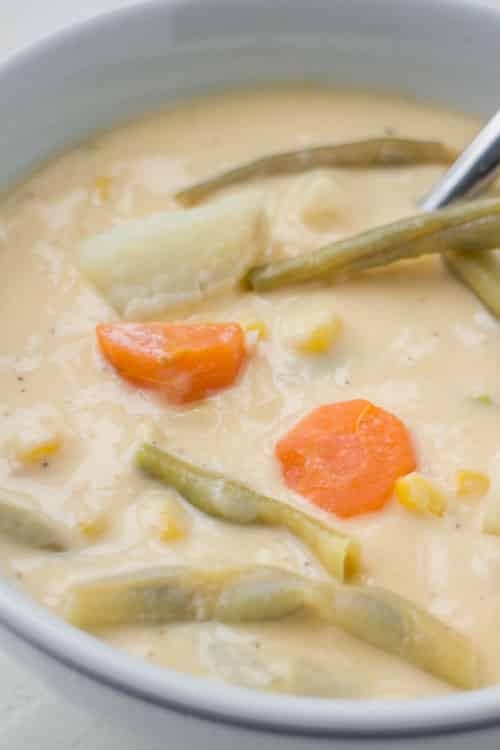 This soup has it all – tons of vegetables, tons of flavor and lots of creamy cheesiness! When I made this and saw people were going back for seconds (and thirds!) then I knew this soup was a hit. While spooning a cheesy taste into their mouth and muttering “This soup is really good!” then I knew I had to post this recipe! 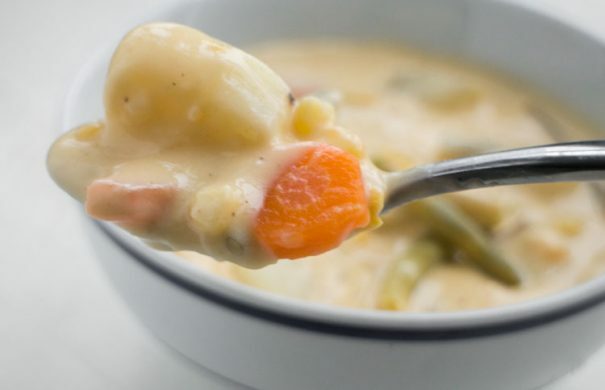 Vegetable soups are usually thought of more broth based, but I love cheesy vegetables. I was able to use our frozen garden green beans and carrots in this recipe. It’s the best feeling when you can use your Summer veggies on cold Winter days! For this recipe I’m using frozen green beans, frozen corn and fresh carrots and potatoes, but you can throw whatever frozen vegetables you want into this. Frozen broccoli, cauliflower, California blend, carrots or peas would all taste great! If possible, don’t skip the potatoes! It gives the soup a heartiness that will fill you up. 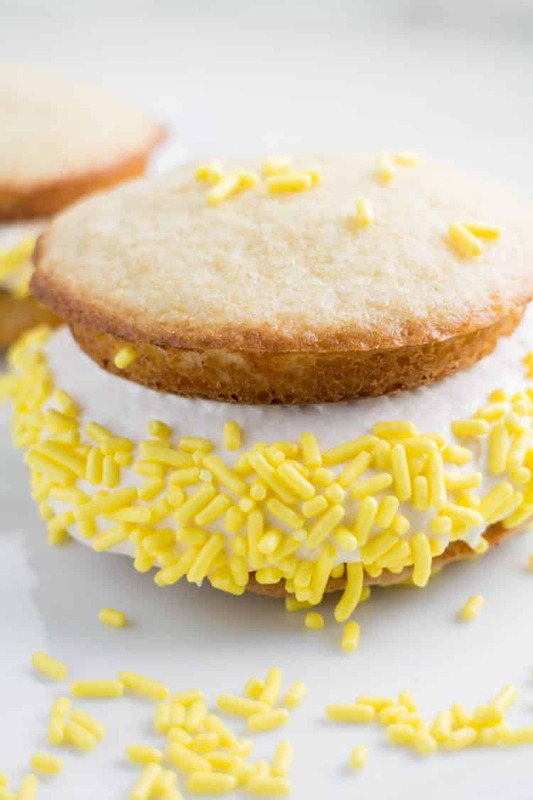 Vanilla Whoopie Pie Recipe With Marshmallow Cream Filling. These whoopie pies taste like cake with creamy marshmallow filling inside. These taste just like the whoopie pies you buy at the Amish market! Whoopie pies were a big thing growing up. We would head to the auction market every Sunday. Sometimes it would be one nearby, sometimes we’d head to the Amish Market in Lancaster. It didn’t matter where we went because whoopie pies would always end up in our basket. 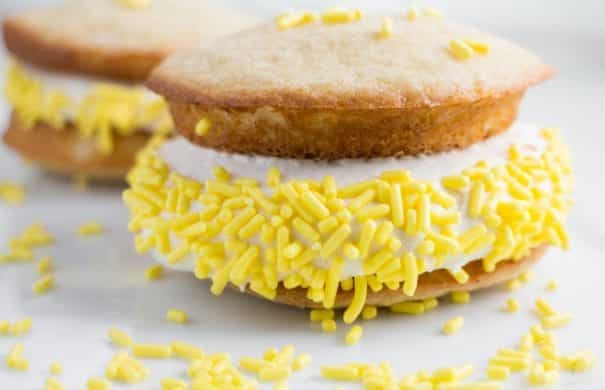 Now with a whoopie pie craving happening but no whoopie pie seen at my local grocer I headed to the kitchen to make a classic Vanilla Whoopie Pie Recipe! I’ve made chocolate whoopie pies and pumpkin whoopie pies in the past but I never made vanilla ones. Vanilla cake is one of my favorite treats so these pies have a cake like texture as they are very soft. And the filling. AND THE FILLING. The filling is incredible. Marshmallow was always the filling for homemade whoopie pies at the market so I went classic with this recipe and kept the marshmallow cream that made me fall in love with them 25 years ago. Because of the marshmallow, the filling is light and fluffy, perfect to go with the soft pies. Scrumptious Chocolate Cookies With THE BEST Peanut Butter Frosting. 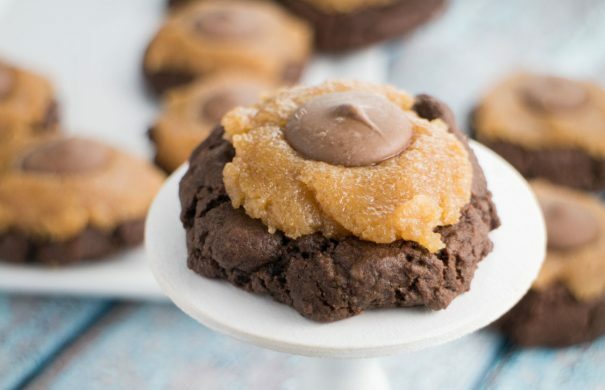 The most popular cookie that friends and families ask me to make! 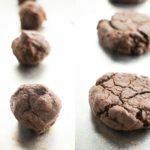 Recipe makes 2 dozen cookies. 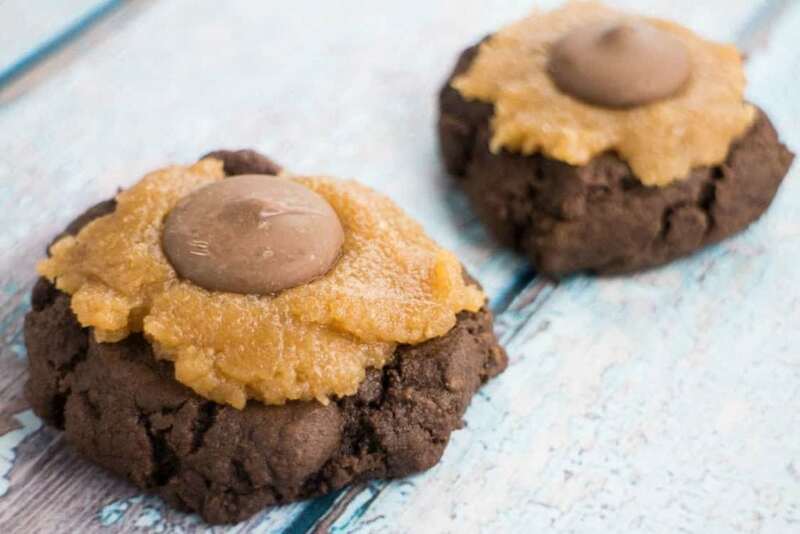 Chocolate cookies aren’t appreciated enough in my opinion. 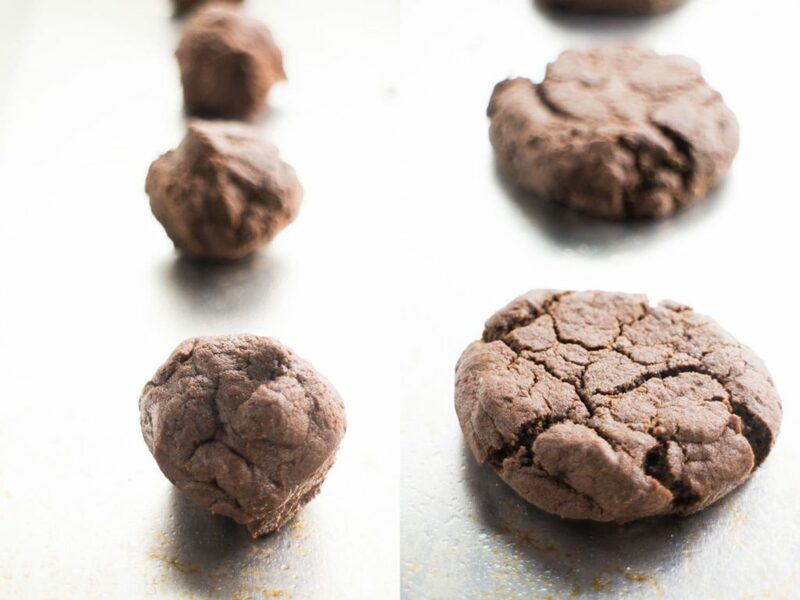 Usually when you hear chocolate in a cookie you automatically think of chocolate chip cookies, but how about straight up chocolate cookies? 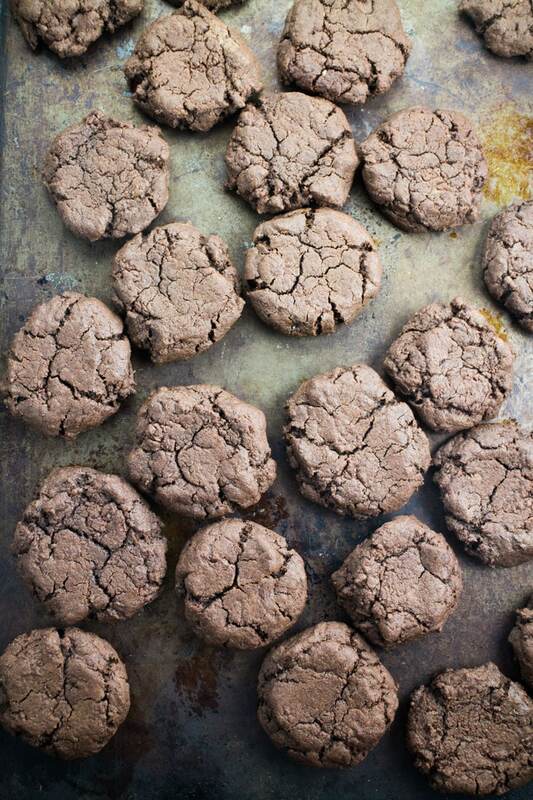 Chocolate cookies are a thing of beauty when you bake them and they get that cracked texture on top. 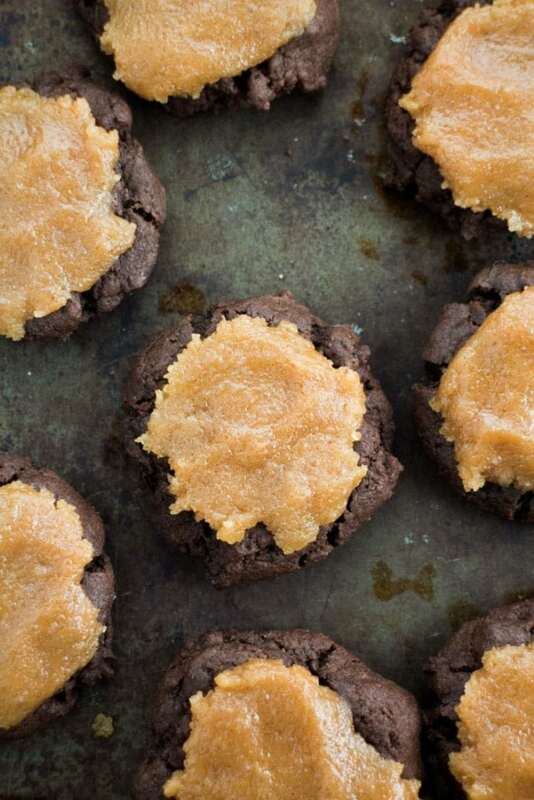 Now throw on some frosting (that’s right) on top and you have your new favorite cookie. 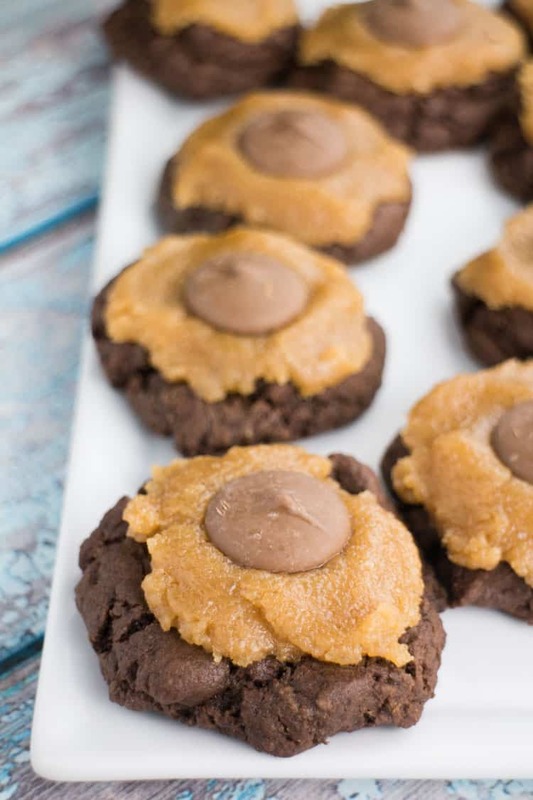 The holiday season is all about comfort food and cookies are on the top of this list. Who else receives cookies as gifts from their mother, aunt or sister? It’s the best! This year I decided I’m going to make cookies and chocolates as gifts to family and friends. There’s something real special about handing a nicely wrapped tin of cookies that still smell like they came straight from the oven to people you love. 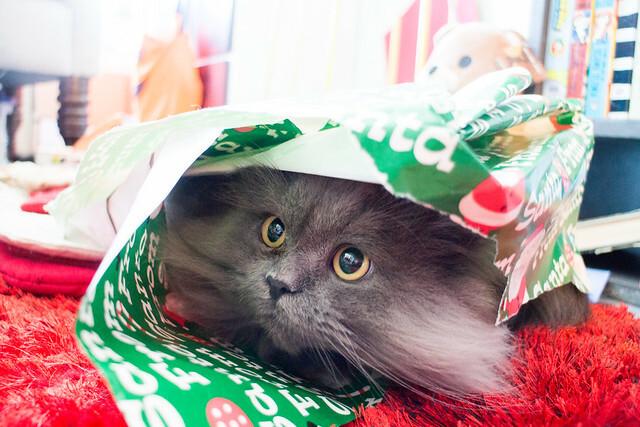 It’s almost as good as unwrapping a Goblin for Christmas. Almost. If you guys can’t tell I’m obsessed with peanut butter frosting right now so I asked why do cupcakes and donuts get to have all the fun? 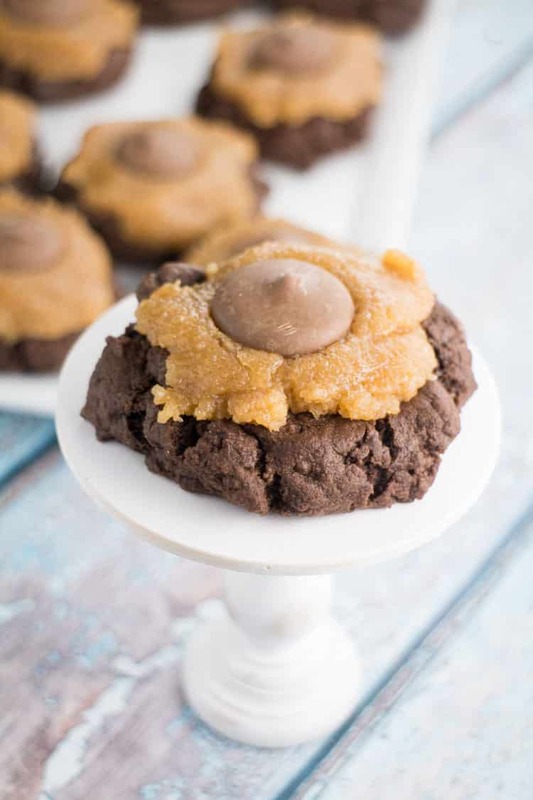 Cookies need decadent frosting too! I’m sure noone will disagree with this… right? This might be the best cookie dough I’ve made. I kept telling myself “You need to eat dinner tonight, don’t eat anymore!”. But I did..
You’ll want to roll these into tablespoon sized balls (pictured to left). Then gently press down with a spoon (not pictured). And then when they come out of the oven they’ll be perfect (pictured to right). I just love how crinkly these look on top when they come out of the oven. When they are finished baking, they’ll be soft, but don’t worry, give them 15 minutes to cool and they’ll harden up. Now you can totally just use this recipe to just make chocolate cookies. Throw some powdered sugar on top and you’re done. 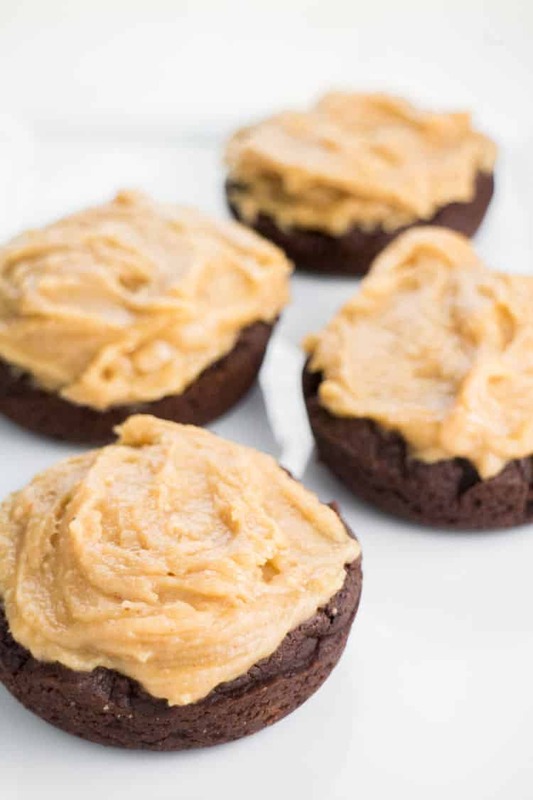 Or you can take them to the next level and add peanut butter frosting on top. OH LA LA LA. 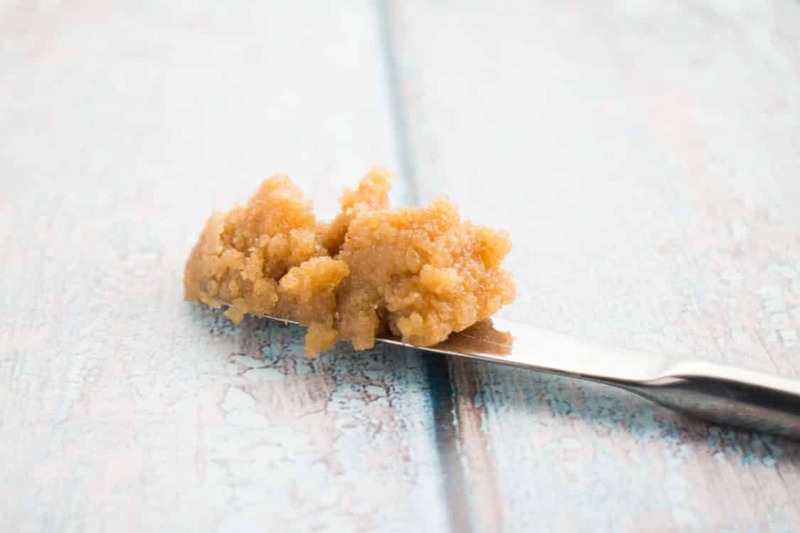 This peanut butter frosting has become a staple in my recipe book. I’ve also learned how easy it is to make my own powdered sugar from making this frosting so often. All you do is take 1 cup granulated sugar and 1 teaspoon cornstarch, put in the blender and blend until it has a powdered sugar consistency. It’s so easy! If I have chocolate wafers in my baking cabinet, I’ll throw one on top of each cookie. Hope you guys enjoy these cookies! Preheat oven to 350 degrees. Spray cookie sheets with nonstick spray or use silicone baking sheets. In a large bowl mix butter, milk and sugars together with hand mixer. Add egg and vanilla and continue mixing. Stir in flour, cocoa powder, salt and baking soda and mix until you have a nice cookie dough consistency. Roll up tablespoons of cookie dough and drop onto cookie sheet. 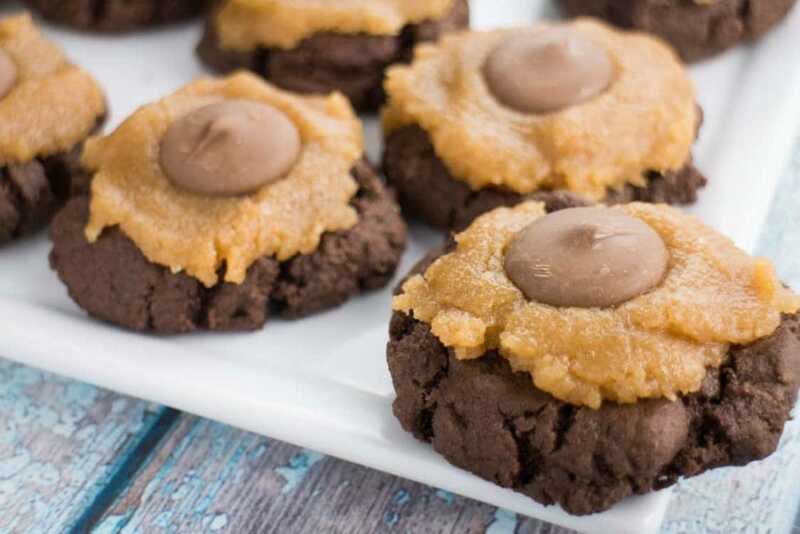 Use a spoon to lightly press down each cookie. Bake for 10-12 minutes. Cookies will be soft when they come out of the oven, but don't worry, they will harden up. Let cool for 15 minutes before removing from cookie sheet. 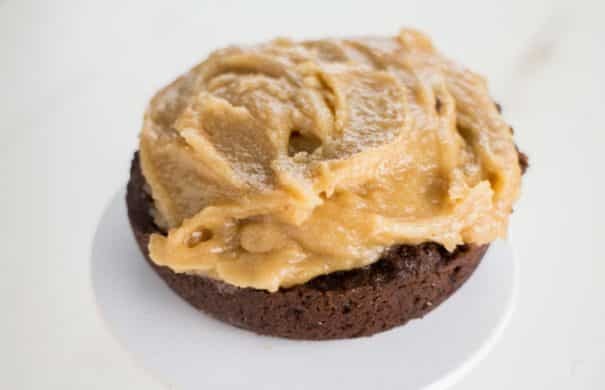 Add powdered sugar, peanut butter and milk in a bowl and use a hand mixer until it forms into a nice frosting. 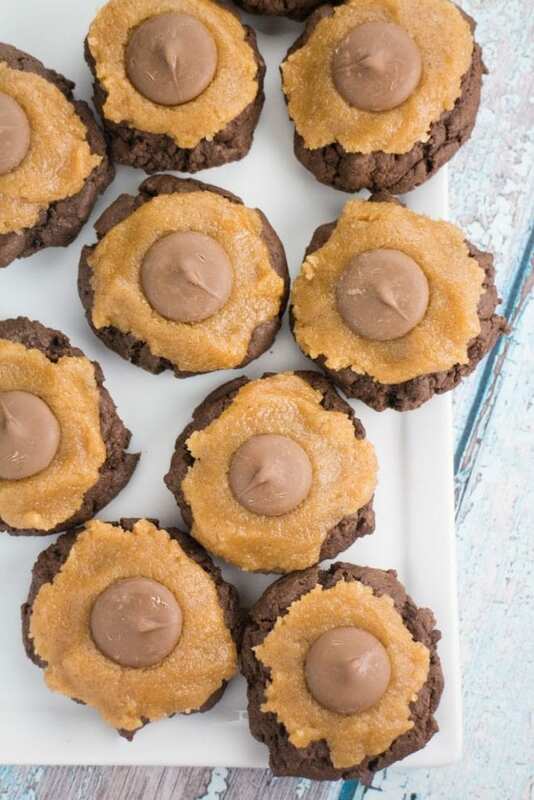 Spread generous amount of frosting on each cookie. Add chocolate wafer on top of each cookie. To make your own powdered sugar, mix 1 cup granulated sugar with 1 teaspoon cornstarch in a blender until it is powdered. I have a thing for donuts. When I’m home and craving a sweet, or need to bring a dessert to a party, I usually grab my handy donut pan and get to work. Sometimes I’m feeling vanilla, other times chocolate, and maybe I’m feeling crazy so I add some tea or berries to make a new flavor. If you don’t have a donut pan, buy one, it will be a life changing moment when you make donuts for the first time. That’s how these Fudgy Milk Chocolate Donuts With Peanut Butter Frosting happened. I needed donuts. Oh my gosh that sweater! Seriously in love with your cat. We try to make as many things as we can. Matthew is a handy man so that means our dinner table, bed, living room tables and more were all made by him. On our walls are photos we’ve made or illustrations we’ve commissioned artists to do. Even my favorite sweatshirt has sweet Goblin’s face on it. 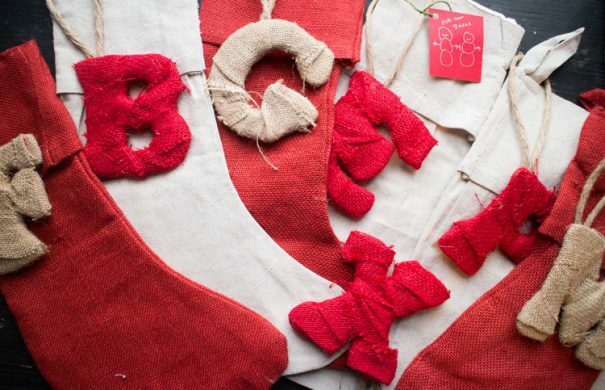 When it comes to the holidays for gifts and decor I’m all about customizing as much as I can. I hand stamp the wrapping paper. I made the gift tags. 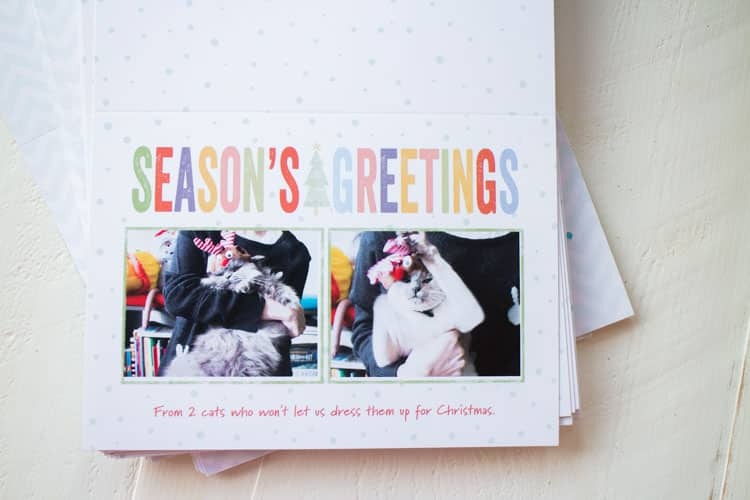 For our greeting cards, we always like to personalize them as much as we can to make them stand out and cause the recipient a smile. 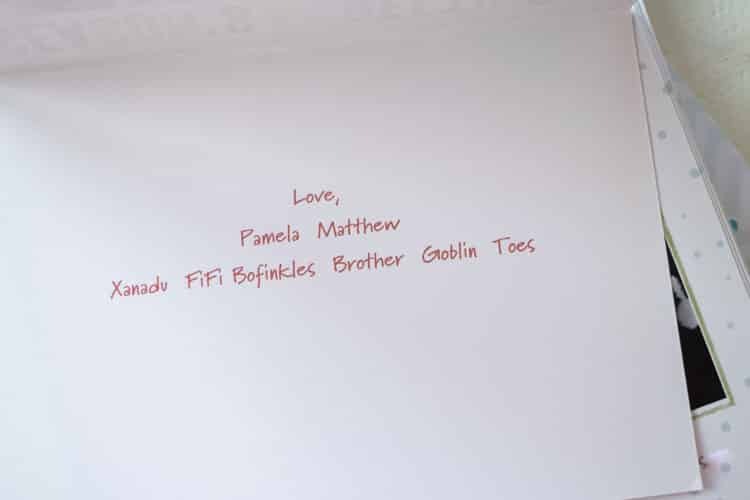 For this year’s cards I decided to try to dress Goblin and Xanadu up… and you can see it went great. So instead of scrapping the idea, why not use the failed photos for a laugh? Can I tell you how annoying it’s been trying to work find clothes for working on the land that actually fits me? We went to a outfitter store a few weeks ago to buy work clothes and the store should have been called “Made for Men” Matthew had no problem finding overalls, jacket, boots and everything else. Their women’s section had dresses, scarves, exercise pants and cashmere sweaters. Ok, that’s real fair. They had no women’s overalls. They had 3 pairs of women’s boots while Matthew had 2 walls filled. I had to try on men’s jackets and overalls which weighed 10 pounds. How was I going to swing my ax with this extra weight? Ok maybe I’m getting ahead of myself. Maybe there will be no ax swinging in the near future, but how was I suppose to move with this extra 20 pounds on me? So I became frustrated and didn’t buy anything. I threw Matthew’s overalls on at home, sauntering around like weighed down zombie, mumbling how nice he had it in life. I have no shame in saying this. Not only do I want work clothes that fit me, I want them to be pretty too. Yeah, take that. Give me purple. Give me blue. Give me pink. Let me match my nails to my overalls. It’s like they’re saying that if you want to work hard then you need to dress like a man. Whatever. I have an ax. When I was seeing darkness finally there was light! There she was, my Carhartt Full Swing Sandstone Winn Jacket! It was nice looking. It was light. It actually fit my body correctly. It wasn’t going to make me sink to the bottom if I fell into a pond. I was in love. Yesterday I begged Matthew to climb up the ladder and get all the Christmas containers down from the loft. I’m not good on a ladder so I leave the dangerous chores to him. After passing each one down to me I dragged them to the other side of the room. Then I coughed because goodness, it’s crazy how dusty this place can get in one year! The lids came off the containers, the snowmen were released from their plastic homes and then Mariah Carey came on Spotify. And then I danced. And then the cats stared at me as they usually do when Mom is one of her dance moods. Check out that flip dance move on Bofinkles. Also apologies to my neighbors but this song is on replay for the next 24 days.